One of my sisters and I have a birthday one day apart. After years of exchanging gifts we finally decided to skip the shipping and just tell each other what we got. That way we get exactly what we want without the hassle and we are both happy. And after years of swapping gift cards, we've started doing it for Christmas too. One sister is paying for a share of my new dog. 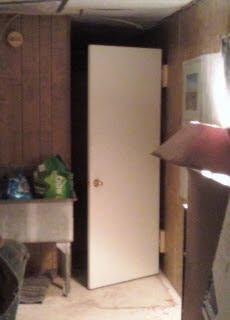 Another sister got me a new door for my hallway. Isn't that nice? It's exactly what I wanted. Thanks sisters! I installed my new door yesterday. I must say that I should have put a door there long ago. It makes a great dog barricade and it was only $10. (Some of you long-time readers may recall that all but one interior door was missing from this mobile home as well as the kitchen cabinets, flooring, furnace, water heater...it is basically just a shell with walls...even some walls were missing...weird.) Unfortunately the door knob that I bought did not come with the correct latching mechanism so I still need a working door knob. In the mean time, I am sliding the very heavy sink over a few inches to block the door and it works great. Eventually I would like to be able to leave the dogs with access to the living room but they are not trust worthy yet. Or I should say, I have not dog-proofed the living room adequately yet. For now they spend their days in the hallway and out of mischief. That does make it easy/saves on shipping and hassle. The pups must think you can't make up your mind on how to block the hallway. My brother and I share the same birthday. Seven years apart. I'm trying to keep those dogs guessing. What do you and your brother do for gifts? Anything? We usually make a small ($1 or $2) bet on a meaningless sporting event that is on TV that week. It makes it instantly worth watching. Sounds kind of lame/cheap, but it works.